Busy times continue, meaning that the Bioscope is rather just ticking over at the moment, but here are your Friday news snippets. Weighter posts will follow in good time, I promise. The tasteful colorization and 3D conversion that Legend3D has performed on my grandfather’s Safety Last clip has given it new life. Harold Lloyd’s film masterpiece from 1923 has been updated for audiences old and new, preserving the magic and dignity of the original film. Some may beg to differ. Read more. New from Kino next month will be the Bioscope’s favourite Buster Keaton film, Our Hospitality (1923), on Blu-Ray and a special 2-disc DVD edition. It comes with a Carl Davis score performed by the Thames Silent Orchestra and a score compiled by Donald Hunsberger. It follows on the heels of Kino’s Blu-Ray releases of The General, Steamboat Bill Jr., Sherlock Jr. and The Three Ages. Read more. A feature film is to be made of the life of Cissie Loftus, Scottish stage actress whose success in America led to the leading role in the film A Lady Of Quality (1913) and a long career on stage and occasionally on film (her last film was The Black Cat in 1941), though with a tragic personal life. Read more. Filmmaker Tacia Dean in The Guardian bemoans the end of professional 16mm printing in the UK with the closure of Soho Film Lab’s printing services. “Many of us are exhausted from grieving over the dismantling of analogue technologies. Digital is not better than analogue, but different. What we are asking for is co-existence.” Read more. It is just the clock-face sequence that has been converted into 3D, but it feels like a gross sacrilege all the same. Indeed. I’m astonished that she can say it “preserves the dignity” of the original. And colorization too?! (And here I thought colorization was dead and buried.) Lloyd’s magic doesn’t need gimmicks to make it “relevant” to new audiences, or whatever it is they think they’re accomplishing with this. Thank you for the link to the article regarding the Safety Last sequence. Most appreciated. 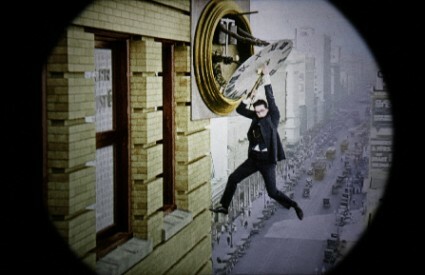 When I spoke to Barry Sandrew from Legend 3D – the company who converted the sequence, it was emphasised that it was more of a tribute to Harold Lloyd’s huge interest in 3D (it is said he took over 200,000 3D photos in his time) so it was felt to be an ideal way of celebrating his 3D work for the audience of the International 3D Society. The colorisation and 3D conversion is not intended for large audiences outside of that award ceremony. This classic sequence will be enjoyed in its original form by most still. Thanks for the explanation. Lloyd was indeed interested in 3D, and would undoubtedly have been delighted to see the sequence. And so long at the original film remains for all to see, then arguably there’s no harm done. But you must allow for silent film enthusiasts to experience a tremor or two of anxiety. It’s like putting a moustache on the Mona Lisa. It’s never quite the same image again.